It's a common thing for critics like me who aren't constantly plugged into the hype cycle to say that we don't know what to expect for certain albums. And while in some cases it's just verbiage in the review to heighten anticipation, most of the time for me it's pretty genuine - if I think I know what's coming from a certain act, I'll tell you, for sure! But with Metric... I just don't know at this point. The last time I covered the group was their understandably underappreciated 2015 album Pagans In Vegas, a pretty damn sharp satire of the mainstream pop music industry that kind of missed the mark when it came to writing that totally stuck the landing with their concept - a good record for sure, but not a great one and certainly one that didn't quite hold up to their releases in 2009 and 2012. But from there... I just wasn't sure what was coming. Emily Haines rejoined Broken Social Scene for a comeback record in 2017 as well as reforming her solo act Emily Haines & The Soft Skeleton for an indie pop album that wound up on my year end list and was better than it had any right to be... also probably better than any individual Metric album, but that's a different conversation. So when you have that, and then she's returning to Metric for their longest album to date and the buzz was inconclusive surrounding what sound the band was taking up this time, I wasn't sure what Art Of Doubt was going to deliver, only with my hope that Haines would bring over her considerable writing heft and hooks from that solo album. So, what did we get on Art Of Doubt? So this is an odd album to talk about, specifically because if you're expecting Metric to back to an old formula that worked throughout the past decade or stick with a consistent sound in indie pop rock and new wave... well, that didn't really happen, because not only do we get callbacks to Fantasies and Synthetica, but also snapshots of a early-to-mid-80s inspired pop rock sound that occasionally reminds me more of The War On Drugs with more verve and foundation. And by embracing that broader focus, Art Of Doubt might just be Metric's most sprawling record to date - maybe not their best and there are definitely points of indulgence that'll hold this back from quite hitting the best of 2018 - but if you're looking for a correction after Pagans In Vegas... well, I won't say you'll predict the direction, but it'll definitely get somewhere. Which, in a funny way fits with the thematic arc of the album, but I'm getting ahead of myself. Now the first thing to note is that if you're familiar with Metric's sound over the past decade, the overall tone of what works from this band hasn't exactly changed. Emily Haines' vocals are still willowy with some really well-chosen overdubs - and there are definitely a few passing glances being made at her solo work in some of the melodic composition, specifically in her backing vocals and on the keyboards. And given that I'm an old-school Metric fan, what I definitely appreciate was the return to a fundamental formula that does have some room for variation if you're paying attention to the details, specifically a rhythm section that pumps up the groove - acoustic or otherwise - while letting the heavier guitars or thicker synths flesh out the lead melody and harmonies; not bassy or wiry enough for post-punk, too synth-heavy for pop punk or emo, but too fuzzed out and heavily mixed to fit with most new wave. And I've always liked how well Metric has balanced their synth choices with the welcome return of rock edge and distortion - nearly always there, but more to add texture and accent to the groove or melody without compromising them. Now there are exceptions to this - 'Anticipate' is almost entirely synth-driven and I do think it suffers as a result, and it's hard to not look at a cut like 'Love You Back' and see a heavier version of a Phantogram song with its whirring grooves - but those are the exceptions to a pretty consistently strong rule, starting with the meaty crunch of 'Dark Saturday' and continuing from there. And while it's easy to point at the acoustic grooves driving 'Risk' and 'Holding Out' as the most obvious returns to Metric's typical sound - although 'Holding Out' has more of a mid-90s alternative rock vibe - on many other cuts the balance and layering is top-notch, from the smoky new wave of 'Die Happy' to the galloping prechorus kicking into the title track to the phenomenal lead guitar melody driving 'Dressed To Suppress'. And while I mentioned 'Risk' and 'Holding Out' feeling like a return to form, with the heavier instrumental swell and blend of gleaming synths it's hard to avoid a War On Drugs comparison, especially with how much momentum Metric continues to bring to some otherwise pretty lengthy cuts. And that length is a mixed blessing too - I'll give Justin Mendel-Johnsen some credit for getting out of the way of some great melodies and letting Metric keep their roiling swell, but especially on the back half of the album it's hard to avoid the feeling that a few of these cuts don't quite know how to stick the landing and really drive it home, just running out the clock. 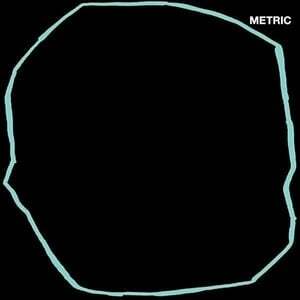 Now, to be fair to Metric that might as well be the thematic arc of the album, with it quite literally spelled out in the title, meant to elevate one's questions and fears and insecurities into art instead of confidence in a defined path. And in this case it allows critics to throw around words like 'deconstructionist' and 'post-modern', but in the case of this album it's actually kind of true and Metric makes a fair amount out of it, starting the record showing the blinkered system of privilege that has her encounter a woman who has never had to work while on vacation, now at the same status but with radically different attitudes and values... so all that pursuit of fame and fortune begins to feel a hell of a lot emptier along the way. Which, yes, was a point they introduced on Pagans In Vegas, but now we're dealing with a much bigger picture beyond just pop music, questioning modern society's idolization of fame on 'Die Happy', the push-pull of appearances and veneers on 'Dressed To Suppress', and how paltry relationships can feel in that narrative on 'Holding Out' - even ones with the audience on songs like 'Dressed to Suppress'. And here's where things get interesting, because Emily Haines is well-aware of the yawning feeling of emptiness that comes with this brand of deconstruction of false narratives, but instead of embracing a natural cynicism or paralysis in the face of unknowns or the feeling that nothing you do really matters, it's a more cautious, open-ended comfort in uncertainty she tries to find, especially as she can't really walk away or dismiss the experiences in her past. Sure, they don't fit into a narrative and meaning might not have been found, but those events and relationships shaped who she became, and that context becomes important, at least to her. Hell, more than that, it becomes literally the anchor point out of deconstruction on 'No Lights On The Horizon', where she highlights those experiences and casual passing words from friends and lovers were enough to drive her into that unknown, to take chances but also not be bound by them or her past, a wonderful twist on 'Risk' I really liked when that old flame re-enters her life - and the feelings are there as referenced on 'Seven Rules' - but just because of that past significance she's not bound to re-engage. And that's another thing I really like about Art Of Doubt, because unlike on Pagans On Vegas which tried for pop satire and kind of lost the train once engaged, Art of Doubt knows the necessity to keep moving - again, for as easy as it'd be for this project to be cynical, it's not - Haines is too smart, too expressive, and too driven to slide into that lane, and she's all the better for it. Now at this point you wind up at the tired question of whether it's better than Fantasies and Synthetica and for me... no to the former, but yes to the latter, at least for me. The themes are tighter, the rock elements are more pronounced, the hooks are stronger, the production is genuinely great, and even if this record meanders, it does so to service a questioning album that has to become comfortable in questioning territory. And I'll freely admit this is not for everyone, as I tend to be a sucker for post-modernism and metanarratives like this, and that it feels like a natural outgrowth and refinement of ideas from Pagans In Vegas has a lot of appeal to me - although the critics who panned Pagans In Vegas for going pop now deriding this return makes me question what the hell anyone wants from Metric at this point. But I do think this is a pretty great release, netting a light 8/10 and absolutely a recommendation for folks who want some potent, groove-and-synth-heavy indie rock. Not quite as insanely catchy as Emily Haines' solo project, or quite at Metric's best as of yet... but for fans looking for the edge to come back, this'll probably win you over, so definitely check this out.